Now that she knows all about twitter, is Mom trying to pull an Evan Ratliff disappearing act? 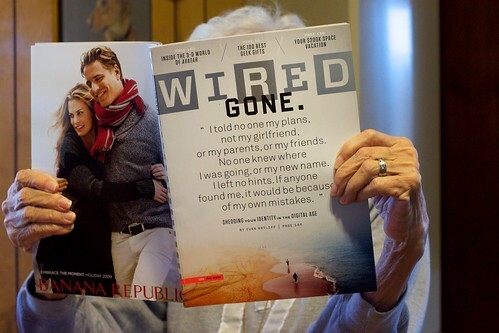 She grabbed my new issue of Wired before I could even read it myself, and was quite absorbed in the cover article. Lest I blog the wrong impression that Mom and I have this fabulous Hollywood scripted movie relationship, let me fill you in that she still can annoy the hell out of me (she gets pleasure at “pushing my buttons”) and she can manage to frustrate me into a fit that flashes me back to age 16. On the other hand, for her having gone through the whole birthing process and raising/supporting me to reach adulthood, I give her a lot of slack. Everyone has a mom. I do love mine, but one is more than enough!